Cleanup. This marks the 10th year PCDC has participated in this city-wide event. With a crew of over 170 volunteers, the largest number of participants PCDC has ever had for this event, we were able to address many areas of Chinatown, from Spring Garden to Arch streets, and from 9th to 12th streets. 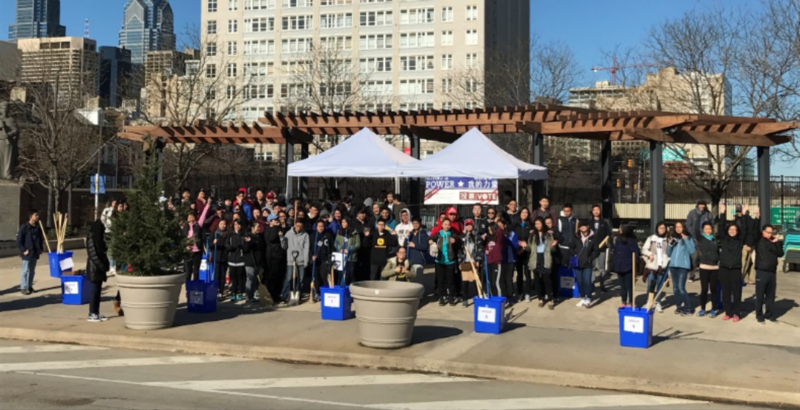 Volunteers were responsible for: sweeping; weeding; removing stickers and graffiti; educating the public on proper waste disposal; reporting pot holes, graffiti, and illegal dumping to Philly 311; and voter registration. This year’s event was truly a collaborative effort from the community. Volunteers from the Philadelphia Suns, Asian Americans United, Central High School’s ‘Spark the Wave’ and ‘Close to Home’ clubs, Philadelphia’s School for Girls, UPenn, UPenn’s AKDPhi, as well as, of course, the Chinatown community, worked together to remove over 50 bags of trash, 15 bags of recycled goods, and 14 bags of yard waste.